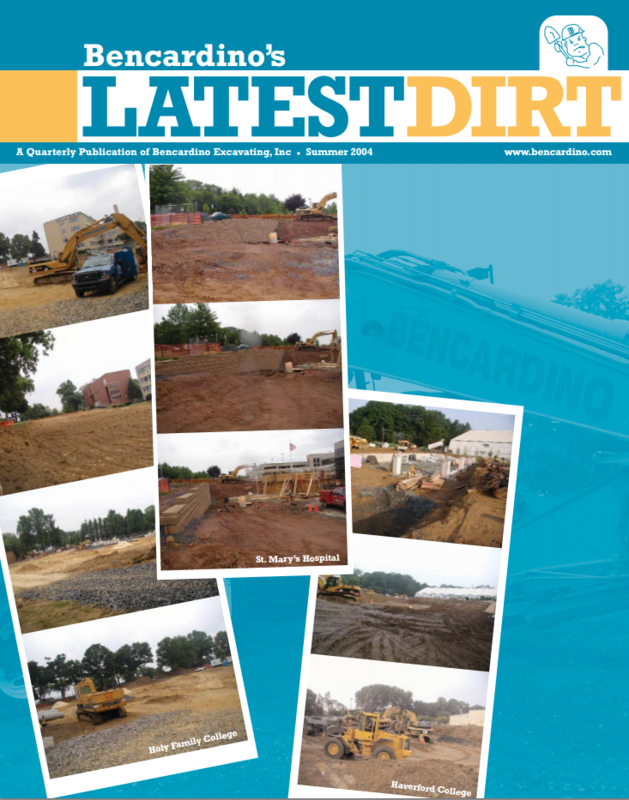 In this issue: The president's welcome, four new employees, status update on Drexel, Haverford College, and more. 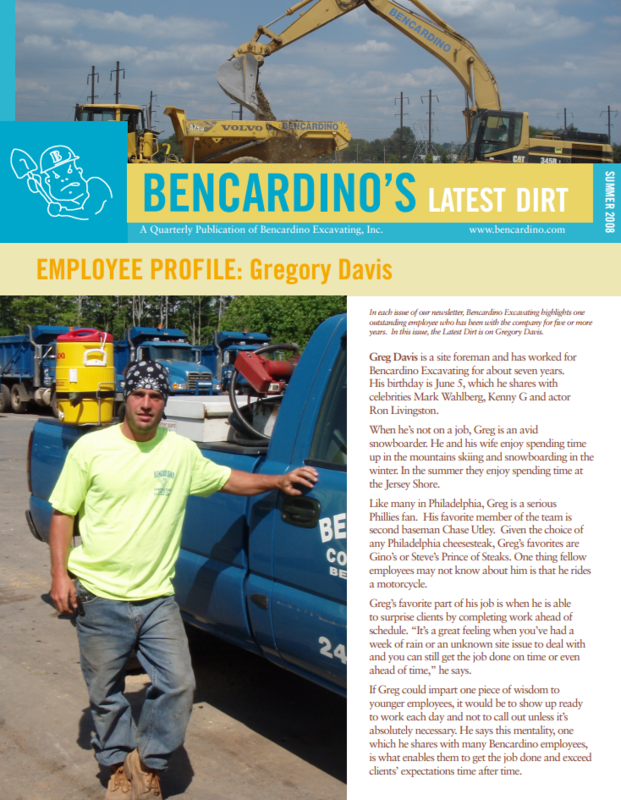 Holy Family College, St. Mary's Hospital, Haverford College, Home Dirt, more new employees, and much more. 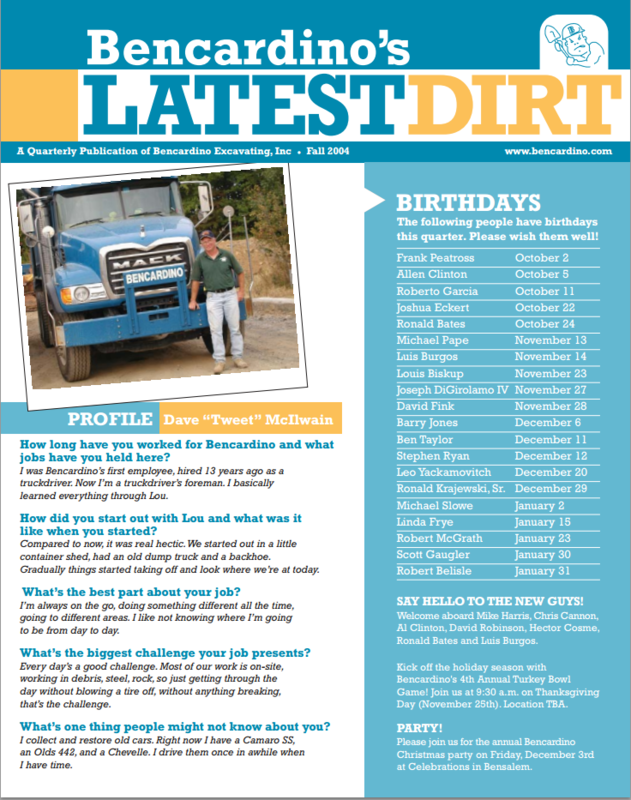 Employee profile for Dave "tweet" McIlwain, many birthday wishes, Home Dirt, and many project updates. 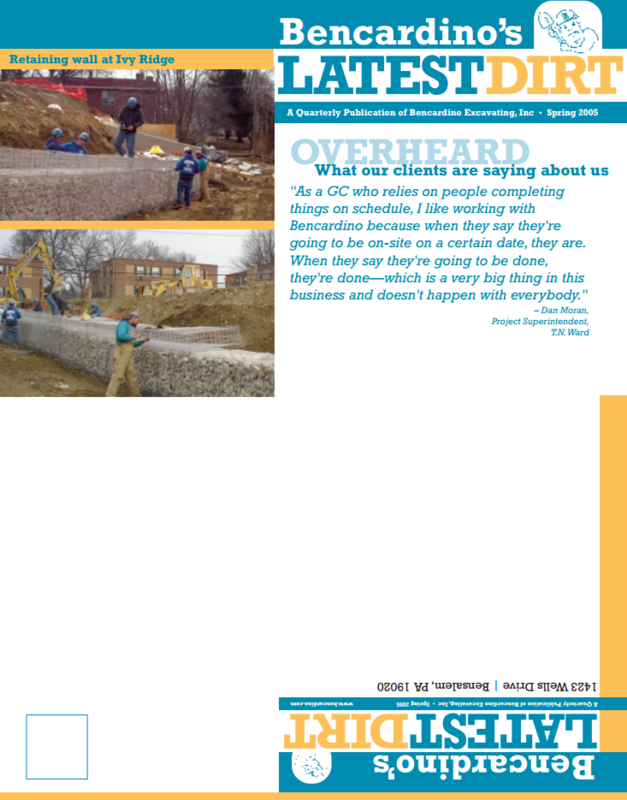 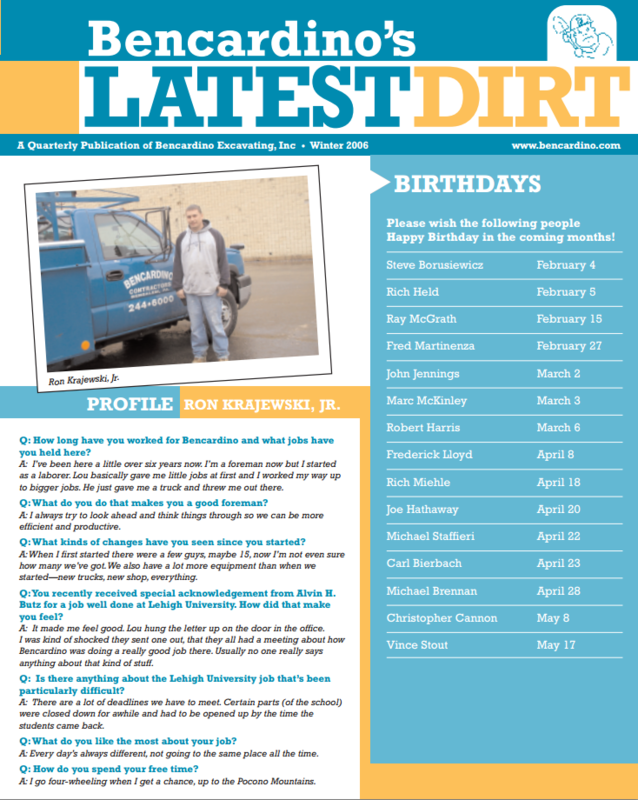 In this issue: John Johnson, birthdays, Home Dirt welcoming new employees, and projects near completion. 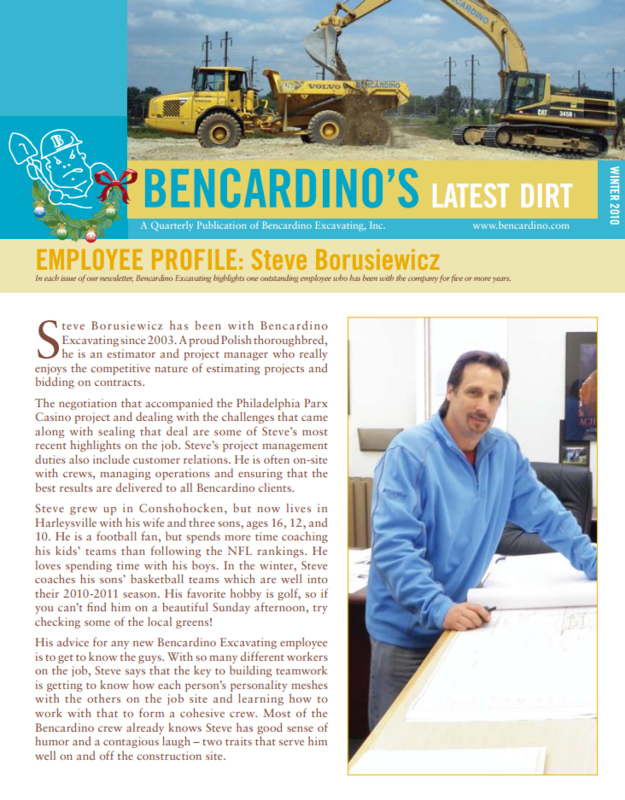 Rich Held - General Superintendent, happy birthday wishes, Home Dirt, and fun at the Christmas party! 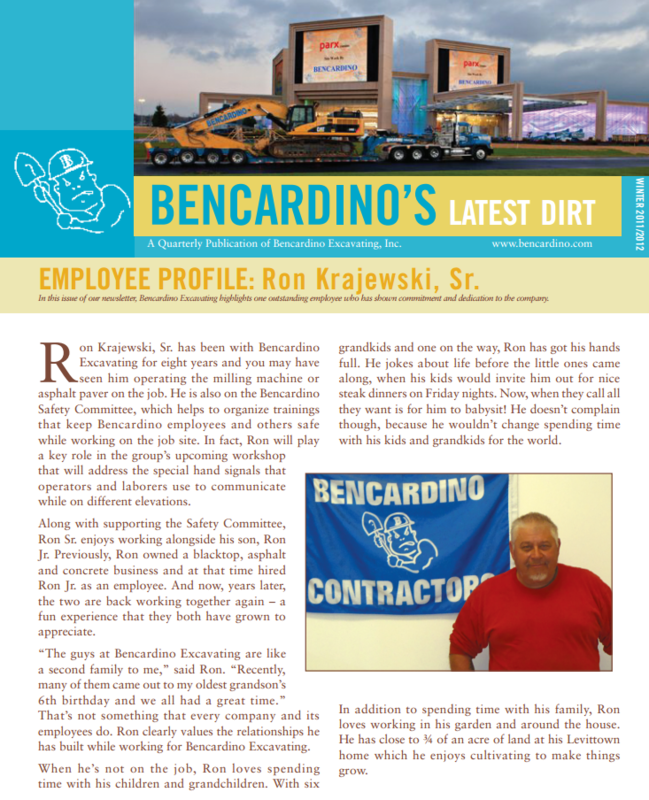 Ron Krajewski Jr. employee profile, pictures from the Christmas party, happy birthday wishes, Home Dirt, and project updates. 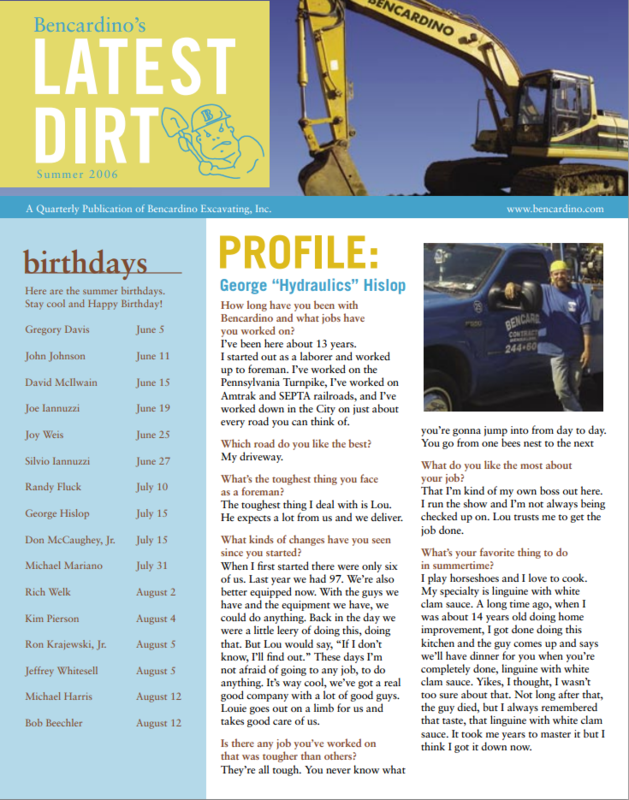 In this issue: George "Hydraulics" Hislop, and project updates. 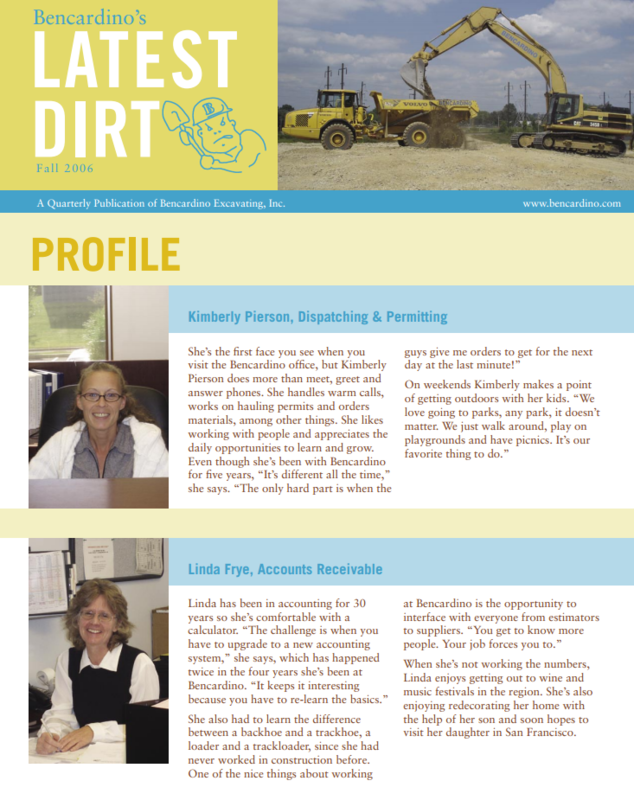 Employee profiles of Kimberly Pierson, Linda Frye, Home Dirt, many project updates, and projects nearly completion. 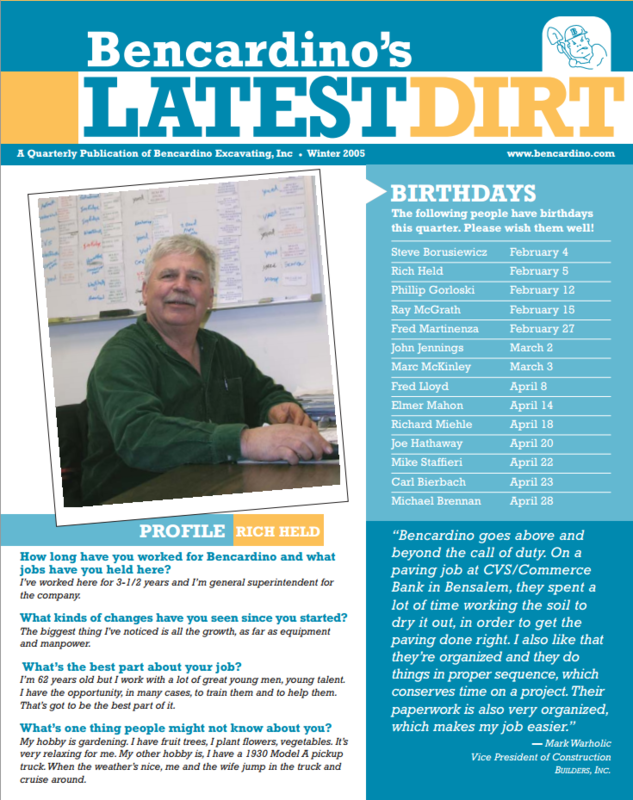 Marc McKinley talks about the Home Depot job, project updates, and happy birthday wishes. 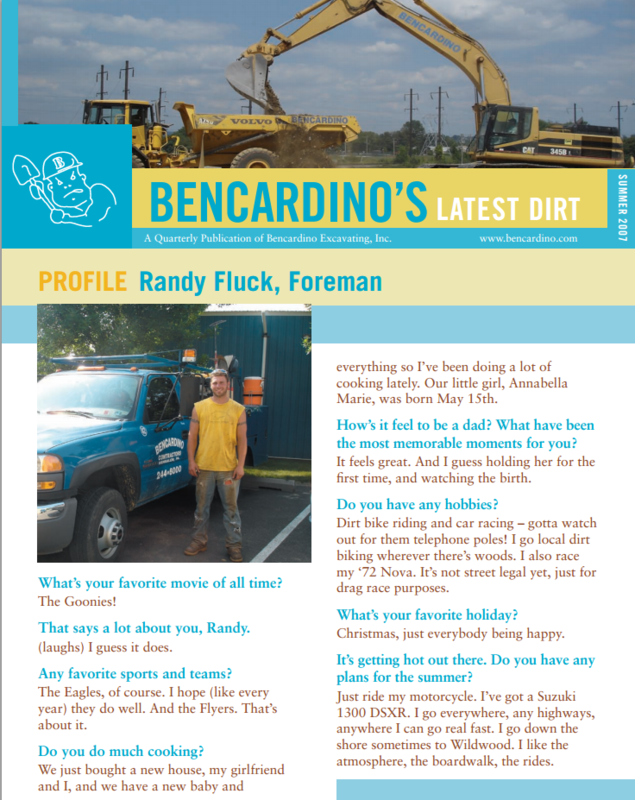 Randy Fluck, Foreman, Home Dirt, New projects, and projects in the final stages before completion. 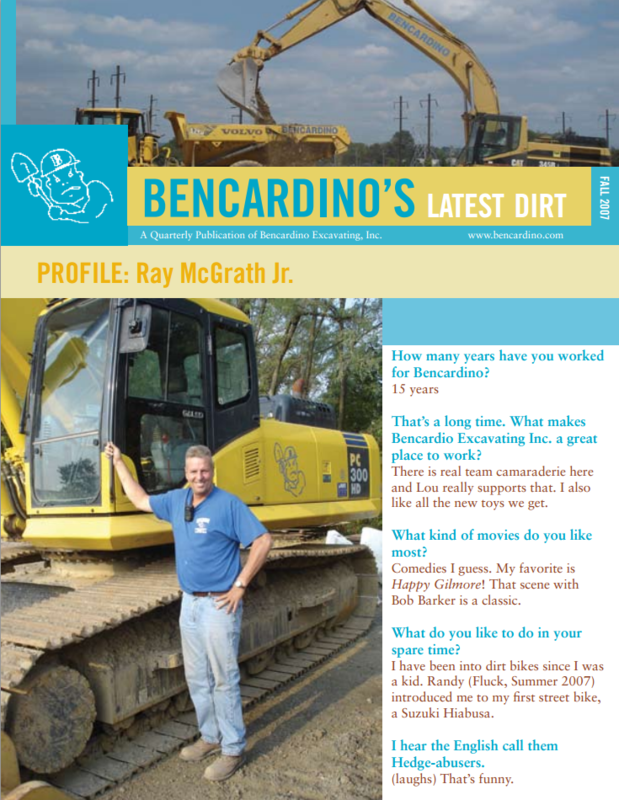 Employee profile of Ray McGrath Jr., new project updates for Meadow Lake, Progressive Insurance, Home Dirt, and many projects underway. 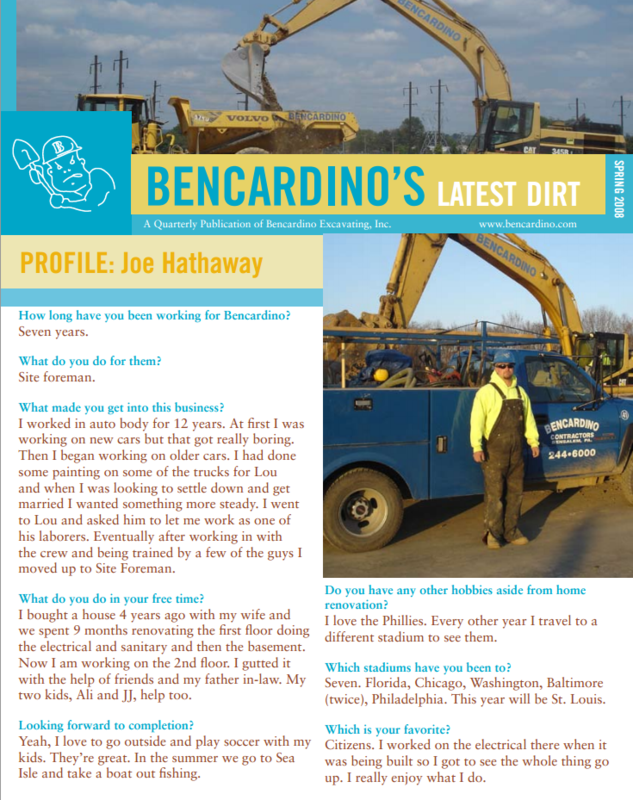 In this issue: Joe Hathaway, project updates, Home Dirt, and more. 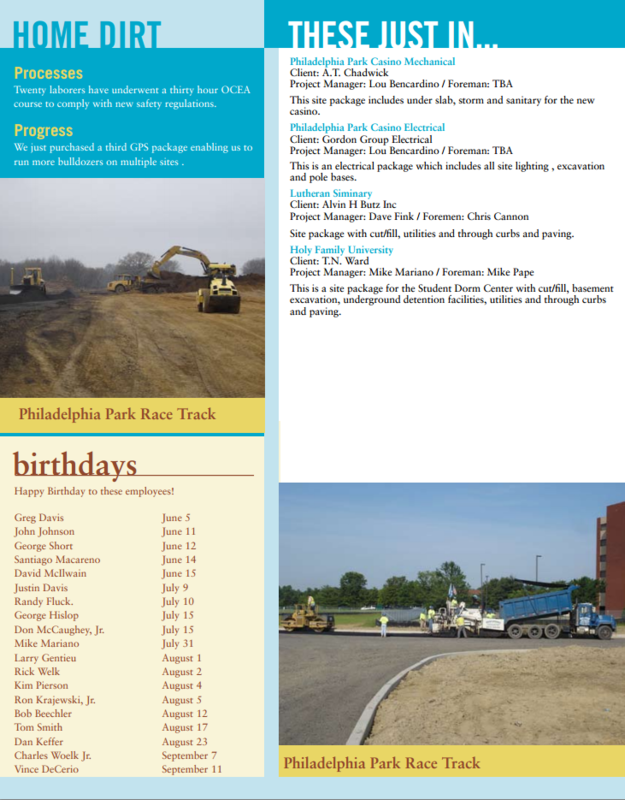 Home Dirt, project updates, and happy birthday wishes. 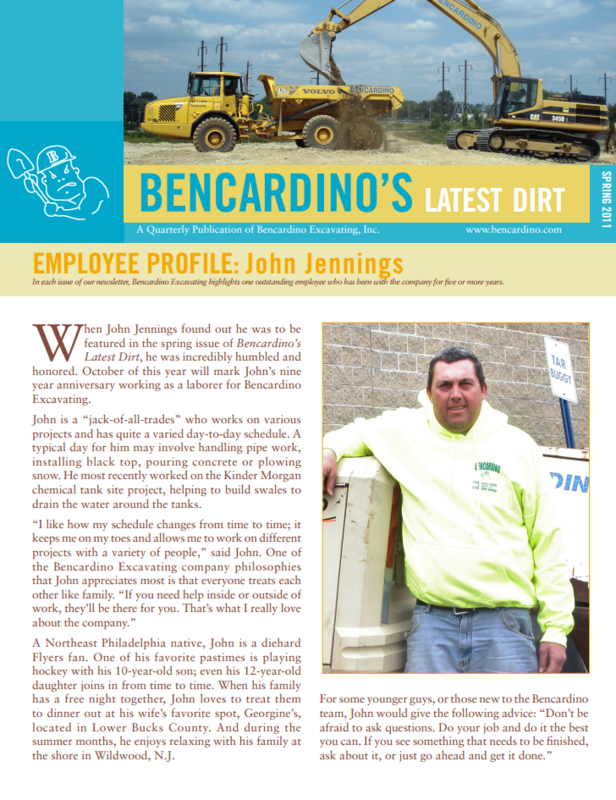 Employee Profile: John Jennings, updates on Kinder Morgan, the Merck Corporate Hanger, and Lou talks about the great work everyone is doing! 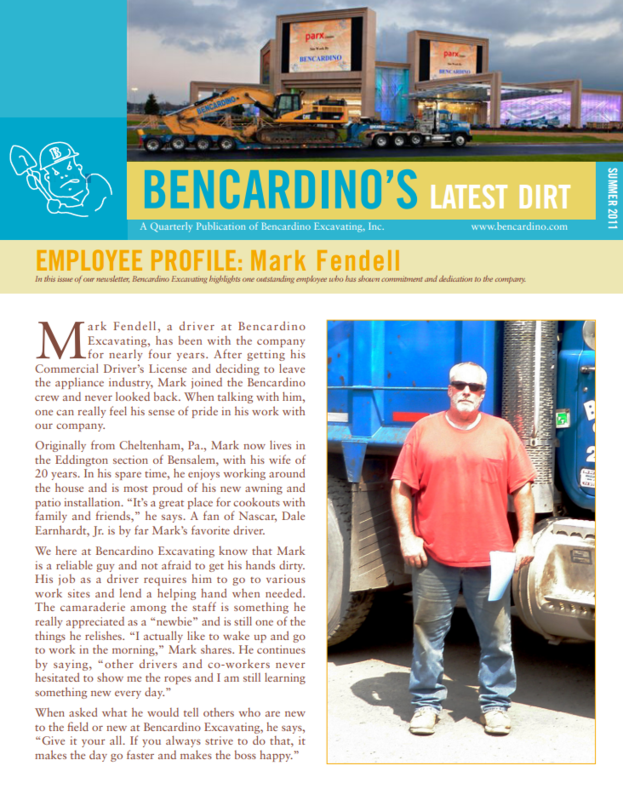 Mark Fendell employee profile, Home Dirt, project updates, and Lou thanks some long time employees. 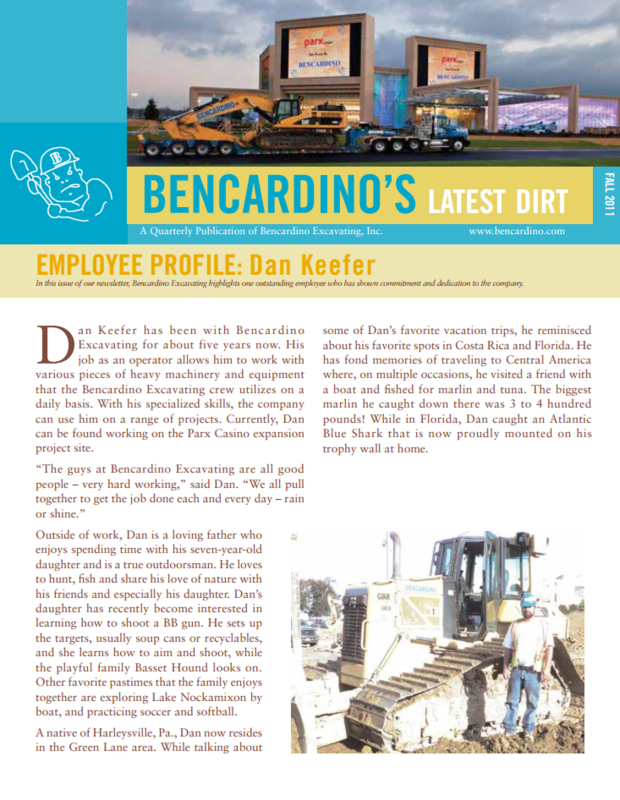 An employee profile of Dan Keefer, many birthday wishes, Home Dirt, project updates, and a note from Lou welcoming the Toms on board. 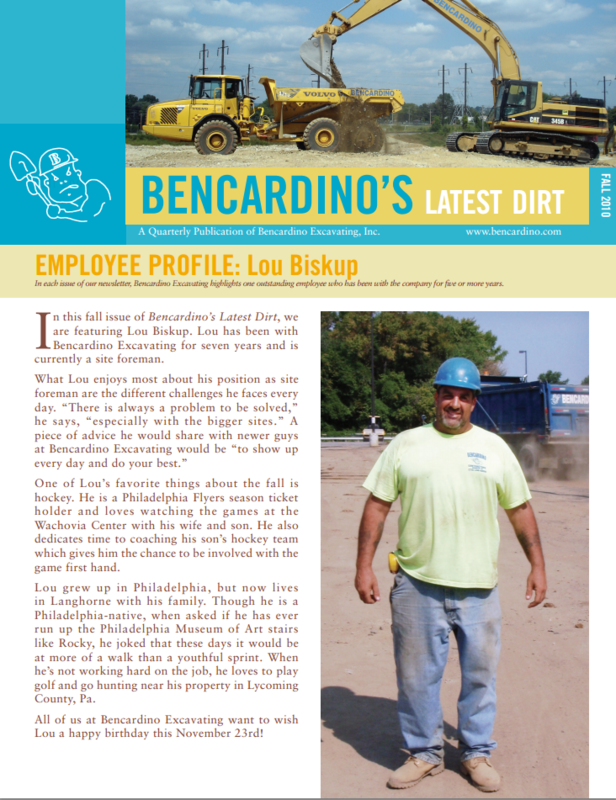 Ron Krajewski, Sr talks, many project updates, and Lou prepares for the 2012 workload. 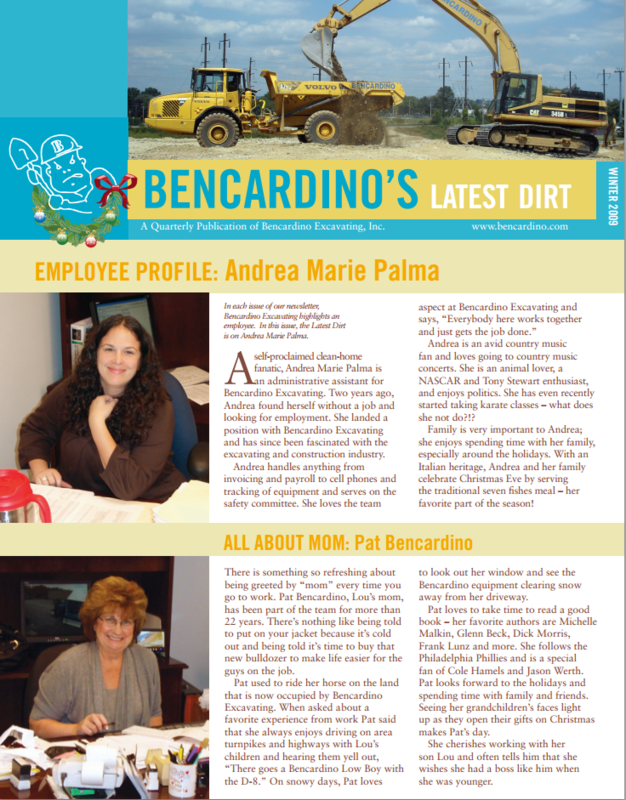 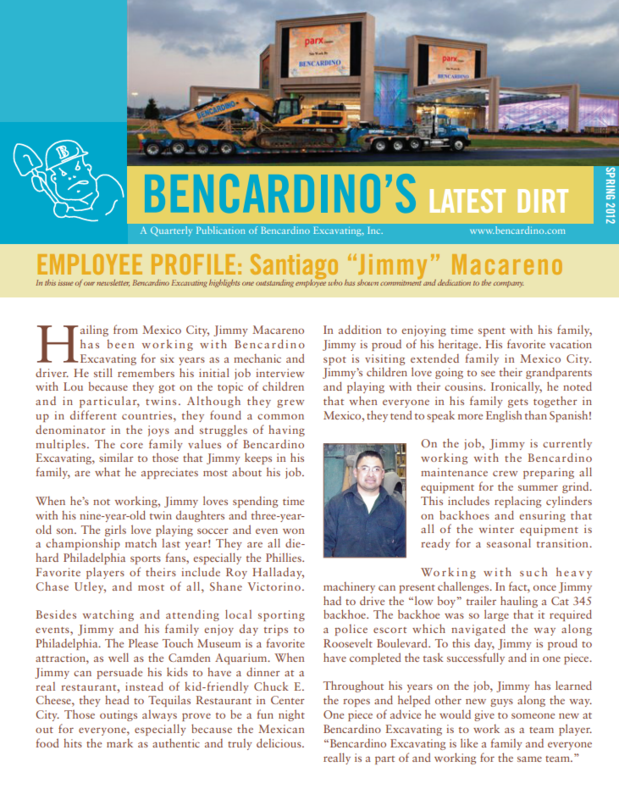 In this issue we feature an employee profile of Santiago "Jimmy" Macareno, project updates, Home Dirt, and a note from Lou Bencardino. 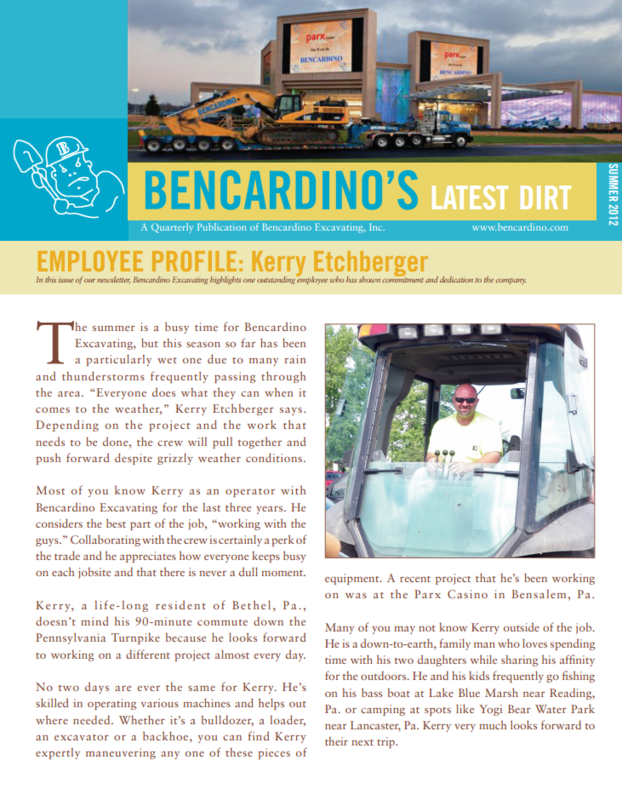 Employee profile: Kerry Etchberger, Home Dirt, updates, birthdays, and a safety note from Lou. 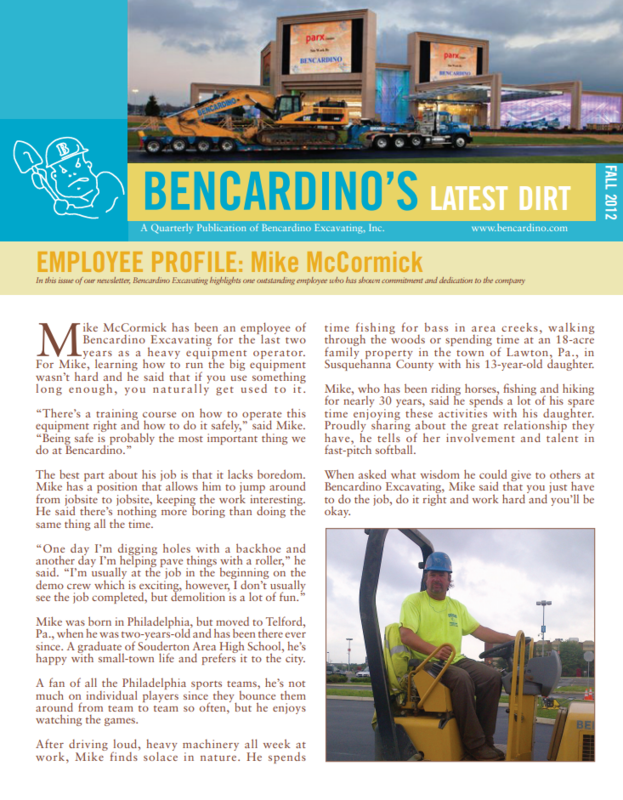 Employee profile of Mike McCormick, project updates, and Lou shares his thoughts on the busy month we have had, and thanks the safety committee, and crew for their hard work and commitment. 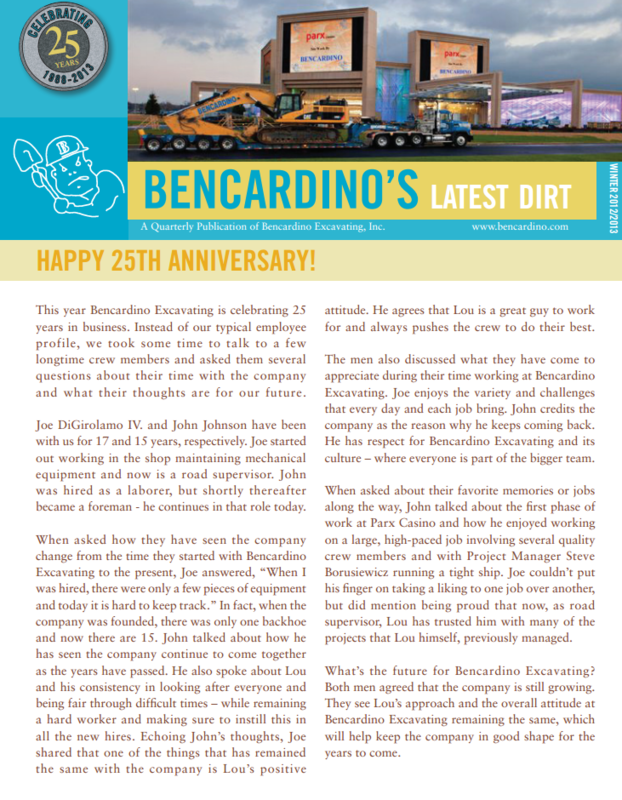 Happy 25th Anniversary edition! 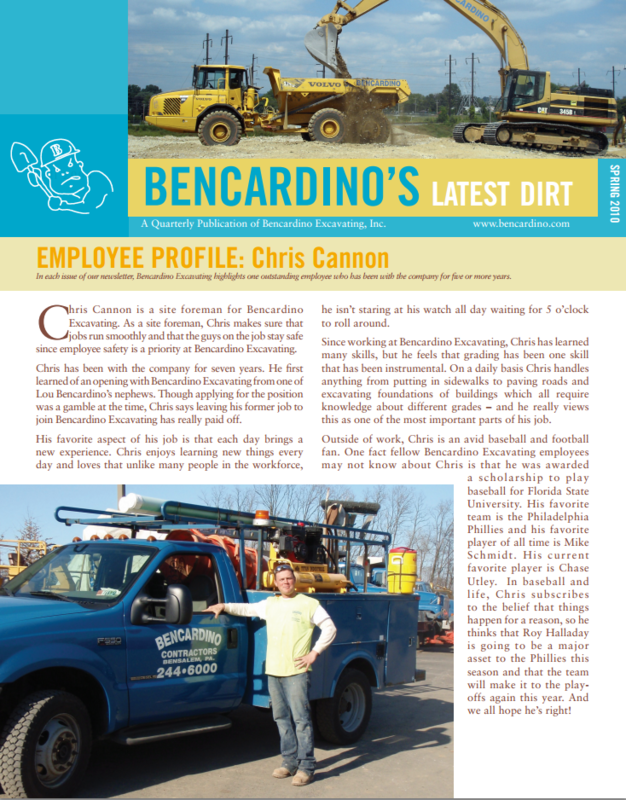 Home Dirt review of our new Komatsu WA250 loader, and Lou talks about his fist piece of equipment; a Case 580 backhoe. 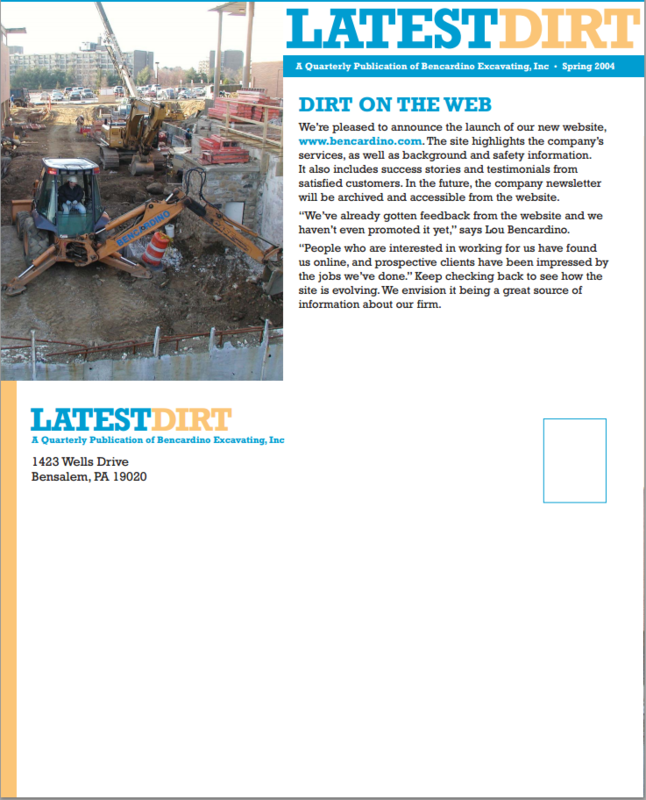 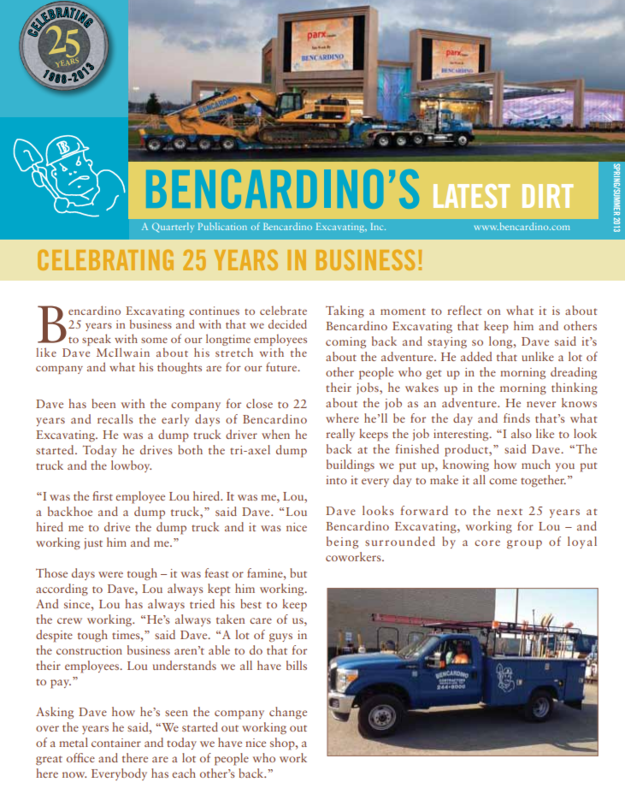 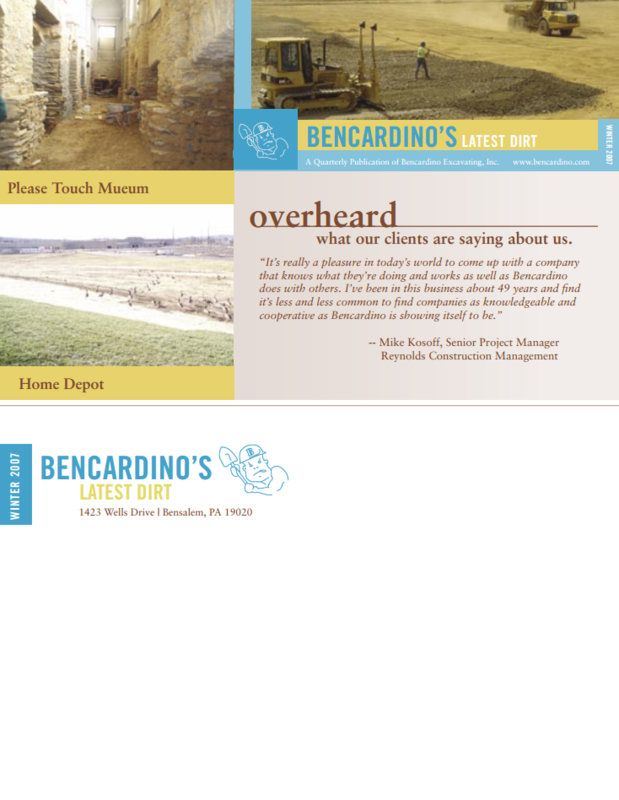 Celebrating 25 years in business, an interview with Dave McIlwain, Home Dirt, and a note from Lou Bencardino.